Dr. Brown vocalist Kev Ellis "warned" me that this new CD would be trippier than the previous ("Inside") and indeed he was right. The fundamental sound heard on Inside is here... the Reggae stylings that many of the British festie bands like, and Kev's vocals are like an ethereal psychedelic Bob Marley. But the two 20+ minutes tracks on Trolleyed fire one up and soar the cosmos well beyond the music heard on Inside. The first track, the 3-part "In", jams along to a steady Reggae inflected bass and drum beat, as slowly rocking guitars and space synths float and meander, creating a soothing extended piece of mind expanding psychedelia. There's plenty of keyboards too, playing subtle symphonic backgrounds and drifting melodies that at times give the music a mid-70's Pink Floyd feel, but far more psychedelic than the Floyd was by that time. There's nothing intense or particularly complex here... just a continuous journey of the spirit and through the mind. 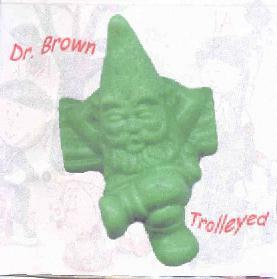 Right from the beginning of the second, also 3-part, track "Out", Dr. Brown kick the pace up several notches into heavier space rock realms. Ellis' vocals retain the distinctive Dr. Brown character while the band travels through territory that brings to mind Ozric Tentacles, Omnia Opera, and even Hawkwind. There's also a syncopated Tangerine Dream type synth pattern that gives an extra kick to the bass and drum. Overall, a gorgeously mind melting spaced psychedelic set. For more information you can visit Dr. Brown at their web site. Contact via snail mail at Dr. Brown; c/o 52 Esslemont Road; Southsea; P04 0ET; UK. Also read the review of their previous CD "Inside" and interview in Aural Innovations #12.